Information on UK student finance and maintenance loans is on the DirectGov website here. Specific DSA information from DirectGov can be found here. Another website worth a visit is the student loans company who offer advice on student loans and finance for students from England. The National Deaf Children's Society have a host of general information (you will need to use the site search facility) on their website www.ndcs.org.uk. The National Union of Students have information to help disabled students and some colleges and universities have a specific disabled student's representative. Click here for more information from the NUS. UCAS also have some helpful information on where to start with the DSA on their site here. Applying for funding under the Disabled Students Allowance? 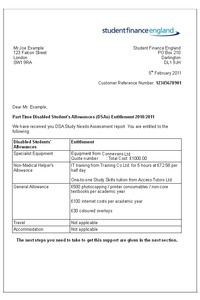 Disabled Students' Allowances (DSAs) provide extra financial help for disabled students. You may get DSAs if you have a disability, ongoing health condition, mental-health condition or specific learning difficulty like dyslexia. Find out more about the DSA on the direct.gov website. There are several stages in getting DSA funding. You can do this by completing one of the forms downloadable from the direct.gov website. If you are eligible for DSA, Student Finance England will write to you, asking you to arrange a Needs Assessment for equipment and support. The Assessor will then prepare a report recommending some assistive equipment. Usually at this stage, the Assessor will approach Connevans and ask us to prepare a quote for the equipment they are recommending, a copy of which will be included in their report. Once Student Finance England have received your Needs Assessment Report, they will send you an agreement letter, listing the equipment and other support your DSAs will cover. This letter will look like the image on the right. You will need to send us a copy of this letter, along with a copy of the report your Assessor did, if you have it. The particularly useful bit for us is the Q00009999 number which is the reference for the Quotation we did for the Assessor at Step 2. You will also need to include your contact details and delivery address for the equipment - bear in mind that there will need to be someone in to sign for the package. Without this letter, we are unable to proceed with your order. If your Assessor recommended a set-up and training session for the assistive equipment, then we will be in touch to arrange this with you. We will ask you to complete a standard questionnaire which gives our trainer extra information about you, your situation and your hearing instruments. The trainer will then contact you directly to arrange a time and place convenient to you - please note, we can't do training sessions at private addresses but usually your university will have a spare room we can use. We generally send the equipment out a week or so before the training session, to give you some time to familiarise yourself with it beforehand. Not received your letter yet? 3. Ask for a training visit to be included – this will make sure you know how to make the most of the advanced equipment you’re being provided with. 5. Don’t forget to talk to your Disability Advisor or Student Support Service about any other equipment you might need as part of your daily life at university. For example, an accessible fire alarm should be provided for you in residential accommodation. 6. MOST IMPORTANTLY – while you’re still at school and have the support of a TOD, try to learn as much about your hearing aids and radio aids. You won’t always have the fantastic support teachers provide so make the most of the opportunity and take control of your own assistive equipment. If you would like to be kept up to date with new things happening at Connevans, sign up here to receive our monthly plain text email newsletter. Copyright 2005-2019 Connevans Limited. All rights reserved.